The line “Based On a True Story” at the bottom of the movie poster apparently is not enough as a disclaimer. Some point out the twisted historicity in the movie “The King’s Speech”. In particular, it has altered the fact that Churchill had adamantly supported the reign of Edward VIII even after he had stated his intention to marry Wallis Simpson, and evaded the early appeasement of Hitler by the British monarchy. My view is this: The King’s Speech is not a documentary, nor even a biopic. It is a film based on a true struggle in the life of King George VI before he became King to shortly afterwards. It spans from the closing of the Wembley Empire Exhibition in 1925 to the beginning of WWII in 1939. The focus is on a personal angle. It has taken some steps to dramatize the sequences which I must say are effective. While I agree the Churchill character in the movie could well be inconsistent with historical facts, I don’t see the production is making a political statement at all nor its intention to rewrite history. The climatic Speech at the end is a historical fact. By every measure, it is an exploration of one man’s internal conflicts and struggles, and how a trusting friendship between therapist and patient, and the support of a loving wife had helped him overcome insurmountable odds. Towards these ends, I think screenwriter David Seidler has done a marvellous job. Further, as an ‘ex-colonial’, I don’t see the film as unfurling the Empire flag to flaunt past glory. If that was the intention, the Queen Mother would not have guarded her husband’s impediment as a painful secret all her life. After watching the film, I came across the book. 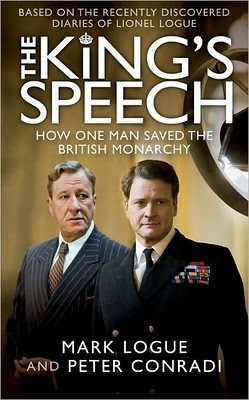 Yes, there’s a book called The King’s Speech: How One Man Saved The British Monarchy, written by Mark Logue and Peter Conradi. Mark Logue is the son of Lionel’s youngest child, Anthony. He is custodian of the Logue Archive. Conradi is an author and journalist. The book is based on a treasure trove of family papers and diaries, letters between the King and Logue, and Lionel’s own notes on the therapy sessions, as well as photos, an invaluable source of background information for the film and a bridge of events therein. Mark Logue acted as the Logue Family Consultant for the production. It was to prepare for his Australian tour in 1927 that Bertie first went to Logue for help. The high point of the six-month world tour would be to open the new Commonwealth Parliament House in Canberra. Bertie diligently went to every appointment and practiced everyday the exercises assigned by Logue. Just between October 1926 to December 1927, the two had had eighty-two sessions. Many more would follow in the years ahead. Further, Bertie’s ill health and an operation on his ulcer had contributed to his physical and psychological torments for years to come. Logue knew it was a complex case and not merely simple speech impediment. mark up the text with suggested breathing points, and the King would start practising, again and again, until he got it right — often becoming extremely frustrated in the process. 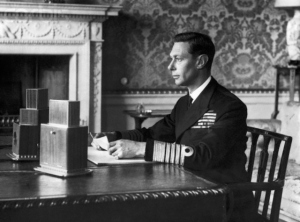 By the time of his Coronation in May 1937, King George VI had greatly improved. All the war time speeches were evidence of the benefits of Logue’s therapy. I mention this just to quench the query of some who might think that the film had grossly exaggerated the speech impediment. Actually, the King had delivered many speeches, and for everyone of them except those overseas, Logue was beside him, giving valuable support and pointers. To the credit of screenwriter Seidler, only three occasions are highlighted: The Wembley Empire Exhibition, the coronation preparation and the call to war, from which the film title aptly derived. Here I can see the choice of a writer skillful at his craft. As always, there is much more information out there that the sheer volume could clog, drag or smother. Seidler has wisely sifted and chosen the pivotal moments and built his script around them. As a result, we have fluency and the economy of words, or word pictures in this case. Here’s a must-see BBC news clipof an interview with David Seidler, in which we can get a glimpse of an actual recording of KGVI pausing during his speech. Lionel’s wife, Mertyl Gruenert, had an ‘imposing’ physique and was several inches taller than Lionel. She was German. As the children grew up in England, they had all involved in the war effort, Laurie and Tony having served in the British army over in Africa. Now to those who challenge that German music is used in the climatic call to war speech and its subsequent scene, they could just as well say the Logue children fought against their mother’s countrymen. Nationalities diminish when the overall picture is one of atrocity and aggression. And lastly, a fact that can be turned into fiction: Logue’s method remains a mystery. He had left no notes as to what exactly went on during his therapy sessions with Bertie. Such missing data have proven to be advantageous to Seidler, who has taken the liberty to create some lively montage in the film. Thanks to the lack of fact, we are entertained. The King’s Speech: How One Man Saved The British Monarchy by Mark Logue and Peter Conradi, published by Penguin Canada, 2010, 242 pages. To read my review of the movie The King’s Speech, CLICK HERE. To read my post Oscar Winners 2011 CLICK HERE. CLICK HERE to view CBS 60 Minutes Overtime’s The Hidden Letters Behind “The King’s Speech”: Interview with Mark Logue and Colin Firth on the Logue Archive: the actual King’s Speech on Buckingham Palace letterhead, with Logue’s markings, handwritten letters between the King and Logue, and other personal papers and photos. CLICK HERE to view CBS 60 Minutes’ The Story Behind “The King’s Speech”: Interview with Colin Firth, including his hometown in Hampshire, his career, his portrayal of KGVI, Geoffrey Rush, and the possible Oscar. Thanks for the clarifications! You did a great job! Thanks for stopping by, D.
I loved the film and would see it again – something I’m not usually eager to do. Very interesting to have more of the background to the story of the film itself. I was surprised, for some reason, that the screen writer is American. For him to have held on to his idea for 25 years, waiting until the Queen Mother was dead, was an act of integrity. Thanks for including the interview clip! Yes, it’s a long wait isn’t it for David Seidler to honor the Queen Mother’s wish. If you recall from my review of the movie, I have a little write-up on Seidler, who was born in England, but evacuated out of London with his family to America at the start of WWII. The trans-Atlantic sea voyage was so traumatic that he developed a stutter after he landed in America. On another note, I didn’t mention in my post is the fact that shortly before the monumental King’s Speech for war, KGVI had conducted a Canadian tour in May 1939 beginning in Quebec to mark Empire Day, then gave his speech in Winnepeg, and after that visited Calgary. Yes, the King and the Queen stayed at the Jasper Park Lodge when they visited Alberta. CLIKCK HERE to read a recent Calgary Herald article on the King’s Canadian tour. CLICK HERE for a picture of KGVI shaking hands with the then Calgary mayor Andrew Davison. Arti, this is a tremendous post. Your insight and great attentions are most appreciated. You’ve made an already very, very rich experience from this film even richer. I loved the BBC clip, and knowing the screenwriter is British-American and waited so long to make the film, honoring the Queen Mum’s wishes. I’m amazed that there are no records of Logue’s methods, and yet Seidler managed to create such fantastic and believable scenes in the film. I really need to see it again. The visuals alone ministered to me. They could be stills, so many shots. The sets were divine. Firth is such a revelation that I wonder how it’s possible? Does he even amaze himself? Seeing the clip reminded me how extraordinary he was. He deserves every award. Funny how I don’t talk much about Rush when I talk about this film. He is so wonderful, always, that I neglect him, I’m afraid. But how necessary he is in this performance. Thank you for this beautiful, helpful post. Of course, don’t let anyone affect your own personal response to the film. I’d be glad though to hear from you after you’ve seen it. Thanks for all this information! I was curious about how accurate the film was, as I knew very little about the king’s speech impediment. It’s good to know the extent to which the film is accurate (although I don’t get too worried when films aren’t — I think we should always be suspicious about accuracy). I’m so glad to have this as a resource to tuck into my files, but even though I read it through, I refrained from following the links and probably will continue to refrain until after I’ve written my own post about the film. Believe it or not, I have been back to see it at the theatre twice more. There’s a sense in which I don’t want to know “the facts” behind the film, and it’s hard for me to explain my prejudice clearly. I keep thinking about Faulkner’s contention that “the facts and truth really have very little to do with each other.” Knowing the details of Logue’s techniques might have been interesting, for example, but in the end I suspect any technique would have done. It was the relationship of trust developing between the men that allowed the techniques to be effective. I’ve always been interested in the concept of word as “event”, and clearly this film was “event-full” for me. I just have to laugh – reading the script I experienced the words as commonplace and pedestrian. Hearing them spoken was an entirely different experience. I don’t think it’s merely a matter of an actor’s skill. I think there is something inherently powerful in teaching, preaching, performance, recitation, that give life to words through voice. There are implications here for writers whose words are meant for the page and not for performance, but I’ll leave that for another time! Thanks so much for the effort you put into pulling so much information and background together. I’ll be making use of it – but just not right now! I smiled and nodded when I read your comment. I’ve always enjoyed watching the ‘Special Features’ on a DVD, the ‘making of’ and every single detail of how they crafted a film. But I also know someone who had exactly the opposite sentiment, and refrained from viewing those behind the scene features because they demythicize the movie. Sure’s interesting to observe the various personal responses towards the same piece of work. I’ve appreciated your comment about the difference between reading the script and the actual hearing of those words on screen. I think you’re right in pointing out that: “…there is something inherently powerful in teaching, preaching, performance, recitation, that give life to words through voice.” That could well be the reason why KGVI was so terrified about making speeches and public speaking, for he must have dreaded the stakes of failing to deliver at the crucial moment. I missed your title, somehow, but it relates to what I said, above. It’s so common to assume that “fact” is true and “fiction” is false. I’ve always preferred Lawrence Durrell’s contention that the purpose of fiction is to “rework reality to show its significant side”. Thanks for the interesting LD quote. Here though, I feel it’s necessary to point out certain facts for those who might not be so well informed about this piece of history… myself included. From what I’ve read or heard from interviews, the filmmakers were sensitive and careful not to tread into the waters of exaggeration or sensationalism. Well, bravo, Arti. An excellent piece — not only well written as your posts always are, but so good to have the real story so well and fairly recounted. I simply loved this movie. I know something about the real story, but not enough to hold my own if face-to-face encountering an argument regarding the accuracy. I haven’t had that chance, but have read more than a few. They just make me mad, because as you say, this is NOT a documentary — it is a well written account of of a personal story as told through the lens of time. It felt so spot-on, that I simply was enthralled. (After I turned around and gave the woman behind me a really dirty look after she was in giggles through the whole first scene at Wembley — I really wanted to bop her…). I don’t buy a lot of movies, but this is one that I will want in my personal collection so I can watch whenever I like. (For a delightful hour of TV listening, I caught — quite by accident — Piers Morgan’s interview with Firth, Rush and Bonham-Carter. It was great! I’m glad you find this post helpful. And here’s a quote from Colin Firth regarding the portrayal of the stutter: “We had to find a way to make this sound authentic, and have it be painful. The audience had to experience the pain and the discomfort. That had to not be compromised. But if it was inauthentic it would be catastrophe. If it was too much, too painful, the risk is it alienates people.” You just have to appreciate the sensitivity and consideration put into the performance by the actor. CLICK HERE to read the full interview. Arti, You’ve got us some great stuff here. We’ve been digging and looking around ourselves having seen the film two weeks ago. You wondered in an earlier blog what I would think of it. Here it is, simply put. I laughed at it, tickled by certain British-isms (my stepfather was British) and I felt included in the film for that, for their “ways.” So well done. I cried, at the successful bits, the somewhat sentimental bits, Logue’s antics with his boys (they were so dutiful and smart) and at the struggle with which Bertie wrestled but kept on coming at it, time after time after time. And I crineged of course, about the damn nanny who pinched and deprived our Bertie. Because by the time we find this out in the film, he is truly “our Bertie,” one of us despite his royal upbringing, because he is human and charging again and again at the walls imposed on him. And it was grand to see Helena as a caring wife, so naturally royal without all the intolerable impudence at which she can excel. Geez, she was grand. The film was clearly a 10 for me; it went beyond the boundaries of film to capture a human, and humanity. The scenes of people listening to the radio during Bertie’s last speech in the film tore me up; all those people listening, tuned in, with cigarettes burning to ash as they were stopped in their tracks, with their arms around one another, and the boys in the armies, with their pale faces and youthful red cheeks, and cigarettes again! and the shots of the royal family, taking it all in. I have not yet stopped cheering. We watched the British Academy Film Awards more than a week ago. Wonderful stuff. And we got to see most all involved with the film as again and again, it won awards – yet this was not boring or repetitive. That Helena is an entertainer but so sincere, I would have listened long past the 5 minutes she DID take up had she wanted to go longer. I will be glued to the Academy’s although the BAFA was so very intimate and funny and less stiff, yes, far less stiff than the Americans…. If I had a Twitter account, we could “tweet” during the Awards. Alas, I believe my phone is even too old to allow it, I dunno. Anyway, you’ve done a beautiful job here in this entry. Arti, this is all fascinating stuff. I am always interested to know how much fact is taken from history in the construction of historical books and films, but I wouldn’t demand complete accuracy, because life doesn’t naturally fall into good stories. Sometimes it can resemble art, but rarely does it shape it. We need the shape of a story to help us see clearly into the meaning of what occurs – that’s what fiction brings, the shapeliness that life lacks, the arbitrary but useful markers of beginning and end. It sounds like this film (which I still haven’t seen – waiting for the DVD) pays tribute in an honest and realistic way to all the parts of the real situation that truly mattered. You know, I’m really surprised to learn from all the comments on this post that so many of you don’t mind the blurring of facts and fiction. And may I make one presumption, and that is probably due to your (plural here) perspective being from the literary and creative realm. That in itself is thought-provoking and could have immense implications, something I’ll definitely mull on and possibly would lead to another post in the future. As for the movie, if you have time, I urge you to watch it on the big screen where you can best capture the sound and visual effects as well as the nuances of performance. I’m sure after watching it on screen, you’d still want to get hold of the DVD some day and watch it again, especially the Special Features included there. I’d forgotten this: As for the freeing language exercise that starts with the ‘f’ sound, that could well be a far-flung imaginary treatment. In its own way, that scene attests to the power and believability of the film as a whole. I really, really hate those words and prefer not to even listen to them – and yet, in context, that bit of dialogue didn’t bother me at all. It fit perfectly into the story line and the immediate context, and just made me laugh. This is why DVDs are such a blessing – it’s so easy to forget the “little gems” tucked into a film like this. I totally agree with you on this. And because of this scene, the movie was slapped with an R rating from MPAA. It’s ironic that the US gives the strictest rating in the world. You can find a country comparison here. Here’s an article on the controversy. You can find out what Tom Hooper and Colin Firth have to say about the issue. I’ve also learned from this article that such a therapy was exactly the treatment screenwriter David Seidler had received to cure his own stammer. So, I stand corrected, it’s not so far-flung after all. And one more, to the horror of many, Harvey Weinstein is thinking of editing this scene out to get a lower age rating. Sorry, there was no chemistry between Anne Hathaway and James Franco as co-hosts. I much prefer Billy Crystal, he is the very Best – talented, funny and musical. The King’s Speech takes home 4 Awards, so happy for Colin Firth! Congratulations to the King – I’m a Big fan, so happy for him. The King’s Speech opens on March 3 in Hong Kong, I can’t wait to see it. Thank you for a great post Arti, well done. Another 12 months to the 84th Academy Awards ~ stay tuned folks! Thanks for stopping by and leaving the link to your post. I’m curious to see your cinematic commentary of this film. The story was heart whelming. Wonderful to find you on a simple google search for “Lionel Logue’s sons wartime.” My husband and I, watching the movie for perhaps the fifteenth time, wondered several things which your post helped clear up. Thanks. I’m glad you find this post helpful. It’s a wonderful movie, isn’t it? Thanks for stopping by Ripple Effects and leaving your comment. Hope to hear from you again. Thanks for sharing this fabulous article. I always find British Monarch history so fascinating and The King’s Speech captivated me (Colin Firth didn’t hurt either):) I saw the movie 4 times and would watch it again.